The Israeli composer Paul Ben-Haim (1897-1974) was born Paul Frankenburger and made his early career in his native Munich. Reading the danger signs earlier than most, he emigrated to Palestine in 1933 and soon became one of the leading figures in the musical culture of the emerging Jewish community. His music mirrors his change of circumstance: the early String Quintet (1919) - heard here in its first recording - taps a vein of rich late Romanticism influenced by Richard Strauss, but the rhapsodic First String Quartet (1937) is coloured by middle-Eastern melisma and folk-rhythms. The Carmel Quartet is one of Israel's longest-standing and most successful chamber-music ensembles. Established in 1999, the Quartet has won numerous prizes, including first prize in the 2001 'Prague-Vienna-Budapest' competition in Reichenau, Austria, and first prizes in the 2004 Aviv competitions. Shuli Waterman studied viola with Gad Lewertoff in Tel Aviv and with the late John White at the Royal Academy of Music in London, where she won first prize in the Theodore Holland viola competition. 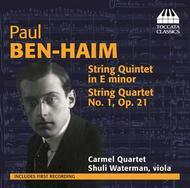 She is principal violist of the Tel Aviv Soloists.